This is a great topic because few people know or understand that Linoleum floors are actually a wood floor. That is correct! The purpose of this article is to explain the step by step daily cleaning procedures for commercial buildings of how to clean linoleum floors, what the linoleum flooring is made from and the tools and supplies needed to clean linoleum floor. As a general rule, Commercial tile floors should be cleaned daily. Whereas in a residence, it may be impractical to clean daily but tile floors should be cleaned at least weekly or more often depending on soil conditions of the floor. If the reader is interested in tile floor cleaning for a residence, please click on the following link and it will take you to another article covering residential floor tile cleaning (Tile Floor Cleaning – Floor Finish Coated Tile Procedures, Product and Tools). Linoleum floors are made from Wood Flour, linseed oil, fillers, binders (adhesives) and a protective coating. That is correct…a true Linoleum floor is made of wood flour. So it is important to remember how to clean linoleum floors is to basically handle and maintain true linoleum flooring as if you were maintaining a wood floor. Remember that wood hates water and so does Linoleum floors. 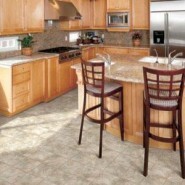 Use the least amount of water and cleaning product as possible to clean the floor. The protective coating from the factory is durable but with anything else, wear and tear from foot traffic can have an effect on the protective coating. This factory protective coating helps prevent damage from water, cleaning solution and wear from foot traffic. However, a top coating seal should be applied to newly installed linoleum floors but only after 5 to 7 days after it has been installed. Consult a maintenance products company that has specialized linoleum products prior to completing any top coating or cleaning of linoleum floors that have been recently installed. Scrub floor area with automatic scrubber. Use a single pass; solution control valve half open, pads down, squeegee down and vacuum “on”. Do not over wet the floor and pick up the cleaner solution as soon as possible. Do not allow puddles to sit on the linoleum floor for any prolonged length of time. Allow floor to dry thoroughly. Note: Wet Floor signs should remain until entire process is completed and floor is completely dry. Additional Note: We recommend using products and a maintenance program designed for linoleum floors. Using a product maintenance program designed for linoleum will assist in achieving beautiful looking floors and reduce the risk of damaging the linoleum floor. This includes cleaners, sealers, finishes and strippers. To that end, Diversey, Inc. has developed a commercial chemical maintenance product line specifically for Linoleum floors. We have investigated this product maintenance system and it has performed extremely well. See a website link later in this article for additional information on this program.